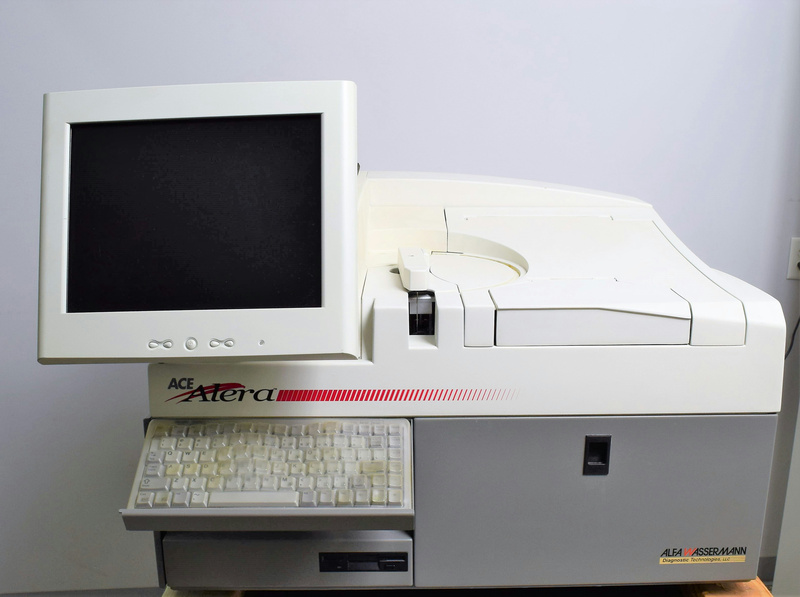 ALFA Wassermann ACE Alera Clinical Chemistry Analyzer Version 1.05 Ref 402900-1 . New Life Scientific, Inc.
New Life Scientific technicians inspected this chemistry analyzer, confirming that it is in good cosmetic condition. There were run errors encountered upon initialization.The technician flushed fluid through the lines (and sensors) and disassembled the fluid arm spindle, greased it, and reinstalled it. All electrical connections were checked and the technician used compressed air to remove dust from the internal components (robotic board). Unfortunately, after performing additional booting of the system, post preventative cleaning, the software will not fully load. The technician was unable to troubleshoot this error, considering the movement of dust caused a short circuit, and recommended selling this system for parts / repairs only. Receives errors upon initializing and the software doesn't load fully.